Jeff Regan was born with underdeveloped optic nerves. He had spent most of his life in a blur. Then four years ago, he donned an unwieldy headset. It was made by a Toronto company called eSight. Suddenly, Regan could read a newspaper while eating breakfast. He could make out the faces of his co-workers from across the room. He's been able to attend plays. And he can see what's happening on stage, without having to guess why people around him were laughing. "These glasses have made my life so much better," said Regan, 48. He's a Canadian engineer who lives in London, Ontario. The headsets from eSight transmit images from a forward-facing camera to small internal screens - one for each eye. It does it in a way that beams the video into the wearer's peripheral vision. That turns out to be all that some people with limited vision, even legal blindness, need to see things they never could before. That's because many visual impairments degrade central vision while leaving peripheral vision largely intact. 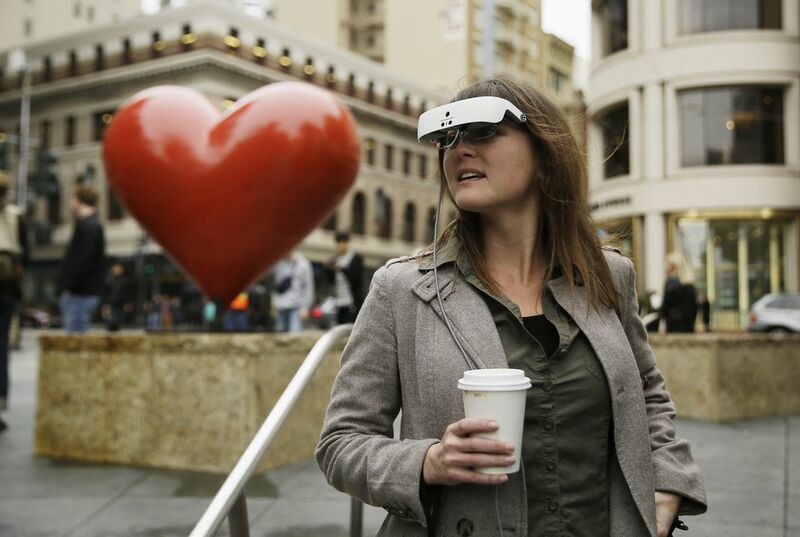 ESight's glasses won't help people with total blindness. But they could still be a huge deal for the millions of peoples whose vision is so impaired that it can't be corrected with ordinary lenses. But eSight still needs to clear a few minor hurdles. Among them: proving the glasses are safe and effective for the legally blind. ESight's headsets don't require the approval of health regulators because they fall into the same low-risk category as dental floss. But there's not yet firm evidence of their benefits. The company is funding clinical trials to provide that proof. The headsets also carry an eye-popping price tag. 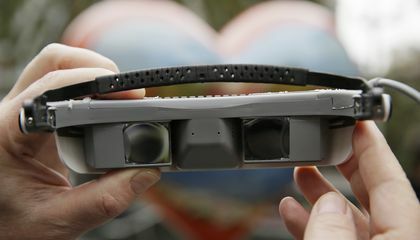 The latest version of the glasses was released in mid-February. It sells for about $10,000. That's $5,000 less than its predecessor. But it's still a lot for people who often have trouble getting high-paying jobs because they can't see. Insurers won't cover the cost. They consider the glasses an "assistive" technology similar to hearing aids. ESight CEO Brian Mech said the latest improvements might help insurers overcome their short-sighted view of his product. Mech argues that it would be more cost-effective for insurers to pay for the headsets, even in part. This might be better than covering more expensive surgical procedures that may restore some sight to the visually impaired. The latest version of ESight's technology was built with investments of $32 million over the past decade. It is a gadget that vaguely resembles the visor worn by the blind "Star Trek" character Geordi La Forge. He was played by LeVar Burton. The third-generation model lets wearers magnify the video feed up to 24 times. That compares to just 14 times in earlier models. There's a hand control for adjusting brightness and contrast. The new glasses also come with a more powerful high-definition camera. ESight believes that about 200 million people worldwide with visual acuity of 20/70 to 20/1200 could be potential candidates for its glasses. That number includes people with a variety of disabling eye conditions. These conditions include macular degeneration, diabetic retinopathy, ocular albinism, Stargardt's disease. This also includes Regan's optic nerve hypoplasia. So far, though, the company has sold only about 1,000 headsets. That is despite the testimonials of wearers who've become true believers. Take, for instance, Yvonne Felix. She is an artist. She now works as an advocate for eSight. She became an advocate after seeing the previously indistinguishable faces of her husband and two sons for the first time via its glasses. Others range from kids to senior citizens. They have worn the gadgets to golf, watch football or just perform daily tasks such as reading nutrition labels. ESight isn't the only company focused on helping the legally blind. There are other companies working on high-tech glasses and related tools. These companies include Aira, Orcam, ThirdEye, NuEyes and Microsoft. But most of them are doing something very different. Their approaches also involve cameras attached to glasses. But they don't magnify live video. Instead, they take still images. Then they analyze them with image recognition software. And then they generate an automated voice that describes what the wearer is looking at. It can be anything from a child to words written on a page. Samuel Markowitz, a University of Toronto professor of ophthalmology, says that eSight's glasses are the most versatile option for the legally blind currently available, as they can improve vision at near and far distances, plus everything in between. Five universities and the Center for Retina and Macular Disease that recently completed a clinical trial of eSight's second-generation glasses. The results won't be released until later this year. But Markowitz said the trials found little risk to the glasses. The biggest hazard, he said, is the possibility of tripping and falling while walking with the glasses covering the eyes. The device "is meant to be used while in a stationary situation, either sitting or standing, for looking around at the environment," Markowitz said. Why must the company provide firm evidence of benefits? Its really cool what they're doing for people that can't see as well as other people. to make sure they work. The company has to make sure they have evidence of benefits because these glasses are very expensive and if I needed them in my life i wouldn't want to pay $10,000 for glasses that don't work. i agree the company has to make sure that the glasses work. They must provide firm evidence of benefits of the company because eSight still needs to clear a few minor hurdles. Among the people: proving the glasses are safe and effective for the legally blind people.ESight's headsets don't require the approval of health regulators because they fall into the same low-risk category as dental floss. But there's not yet firm evidence of their benefits. The company is funding clinical trials to provide that proof about about it.According to the passage "New glasses help the legally bind see" it says that there headsets don't approve health at all. The company provides firm evidence of benefits because ESight's headsets do not require the approval of health regulators because they fall into the same low-risk category as dental floss.There's no firm evidence of their benefits yet. This company is funding clinical trials to provide that proof.According to the article "New glasses help the legally blind see" it says that proving peoples glasses are safe and effective for the legally blind. The company must provide firm evidence of benefits because other companies are also doing something very different.They need to give evidence to prove that they have the best glasses for blind people.According to the article,New glasses help the legally blind see,it states,ESight isn't the only company focused on helping the legally blind. There are other companies working on high-tech glasses and related tools. These companies include Aira, Orcam, ThirdEye, NuEyes and Microsoft.That's why they need to provide firm evidence of benefits. The company must provide firm evidence of benefits because although it falls in a low-risk category, the company must provide firm evidence of benefits in order for people to believe that the glasses work. This is very important because eyesight is a very delicate situation. According to the article "New glasses help the legally blind see","ESight's headsets don't require the approval of health regulators because they fall into the same low-risk category as dental floss. But there's not yet firm evidence of their benefits. The company is funding clinical trials to provide that proof." This information helped me answer the question. The company must provide firm evidence of benefits because they have to know what helps people that don't have a good eyesight.According to the article proving the glasses are safe and effective for the legally blind.ESight's headsets don't require the approval of health regulators because they fall into the same low-risk category as dental floss.But there's not yet firm evidence of their benefits.The company is funding clinical trials to provide that proof.